Springtime in the Hallertau is beautiful: clean, crisp air, the smell of newly emerging greenery, the trees on the rolling hills coming to life and the sight of people out in the fields. We, members of the North American Brewers Association and the High Desert Brewers Association, recently had the pleasure of visiting the Hallertau as the guest of Anheuser-Busch. The Hallertau region of Bavaria, north and east of Munich, is the largest interconnected hop-growing region of the world. There are approximately 2000 producers on 40,000 acres in the area ranging from large to small farms with fields no larger than a couple of acres. The average size of the German hops farm is only 6.4 hectares; that’s just 16 acres! These are independent farms that offer their hops for sale on their own. It’s a different sort of market than that of the U.S. where there are large farms and co-ops to deal with. One of the buyers in this diverse market, the man who navigates it for Anheuser-Busch, is Dr. Willy Buholzer. It is his job to select and purchase German hops for A.B. Dr. Buholzer is also the general manager of the Busch Farm Huell. We were very fortunate to have him conduct us on a tour of the farm. Dr. Val Peacock, A.B.’s Manager of Hop Technology, accompanied us on the tour, which was hosted by Simon Archer, the farm manager and Willy Wright the farm consultant. This all-star lineup left no question unanswered and no process unexplained. The mission of the farm is to contribute to the production needs for Budweiser as well as for development and evaluation of new varieties. 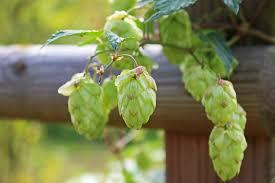 On the farm’s 34 hectares they grow the aroma hops that are used in A.B. beers; Hallertau Mittelfrueh and Spalt Select. These are some of the same varieties that are grown at the Elk Mountain Hop Farm that A.B. has in Northern Idaho. As a matter of fact, if you follow the latitude line from the panhandle of Idaho eastward on your globe, you’ll find it runs right to the Hallertau. This is not coincidence. The site in Idaho was chosen because the latitude is the same as the Hallertau and therefore the length of day is the same. Length of day is one of the important factors in the production of fine hops. Since we where there in early spring, there was not much to see in the fields. The hops were just peeking out of their winter beds barely tinting the fields green. The farmers had just gotten enough good weather to get in the fields and put up the climbing wires on their trellises. It was a very different look at a hop farm. We were shown all of the inner workings of the hop processing. Starting with the stationary combine in the barn that separates the hop cones from the vines and wire we moved through the processing. It is so much easier to see how things work without the hops moving through the process but you do miss the great aromas. We moved on to the drying rooms where the moisture content of the hops is adjusted for optimum for storage. It is an ingenious combination of ramps, conveyers, and movable floor louvers that allow the hops to be dried and moved with the minimum of damage to the cones. The hops then fall into the bailer where they are packed for shipment. Many of the hops grown at Huell are for testing of the newly developed genetic variants of the German varieties. There are experimental plantings of 25 aroma varieties that are so new they have not yet been named. Dr. Buholzer explained the reason they grow these new varieties is because they are looking for “something better, more resistant to disease” and “looking for better taste and drink ability.” It is important that the new hops, hops that may show a high yield for example, maintain the flavor, aroma and bittering qualities the brewers require. Growing, lab testing and test brewing evaluate these qualities before they go into production. Why not let someone else grow the hops for A.B. and not go to the expense of a farm? Having an experimental farm allows the A.B. hop team to “walk the fields and look touch and smell” as Dr. Buholzer puts it, to gain insight into these new hops. They don’t have to look very far for a source of new varieties. Across the road from the Busch Farm Huell is the foremost hop research center for hops in Europe. It is no accident on A.B.’s part that the farm is located there. The Hop Research Institute Hüll is the result of a cooperation between the Society of Hop Research and the Free State of Bavaria. The Society of Hop research is supported by its brewery members and the Bavarian Research Centre of Agronomy represents the state. The Institute has a staff of 25 scientists and technicians who are tasked with developing new varieties of hops for the European brewing industry. This breeding program produces 70% of all the hop varieties in Germany. Dr. Bernhard Engelhard, the head of the Institute, greeted us and showed us the state of the art lab facility. We spoke to researchers such as Dr. Kammhuer in his lab, where he studies and tests the hop acid characteristics and yield of the experimental lines, which is critical to the hop producers. The new strains must be able to economically produce the proper chemistry needed for brewing. “It is not just flavor and aroma” he explained, that makes a new hop variety worth production. The Institute acts as an information center for the hop growers similar to a university extension office. It’provides not only new hop types but also advise on methods of production. One example was a study they did of how much nitrogen is needed to produce good hops. It was discovered that the local producers were using twice as much nitrogen fertilizer as was needed and that the excess was showing up in the ground water. The information from the study was put into production and not only saved money but prevented problems with the water supply. Disease resistance is the number one priority for the new hop types. The plant breeders at the Institute make about one hundred plant crosses each year using existing hop cultivars, other varieties and even some wild parents. Only the female plants are grown because they produce the strobili (cones) that contain the essential oils and acids used in brewing. The male plants are kept in another facility miles away. If the male plants were allowed to fertilize the females they would produce seeds instead of cones. Like any good parents, they don’t want any uncontrolled accidents. The work is done in double contained greenhouses and on 9 hectares of trail fields. From the one hundred crosses, 100,000 to 150,000 seedlings are grown. Each young plant represents a genetically new strain. They are subjected the hop diseases powdery mildew and downy mildew by growing them in proximity to infected mature plants. Those that do not contract the mildew are selected for more study. Around 4,000 will get a 3-year field trail and of those 20 to 30 will survive for further testing for acid content, flavor and aroma. Only one in a million of these crosses will ever make it to market. 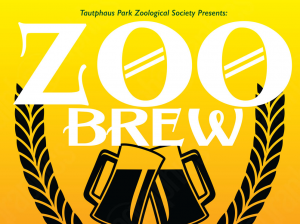 Anton “Tony” Lutz, supervisor of the greenhouse program, told us “if a brewer wants something new in production he has to tell us 20 years ahead”. This speaks to the dedication these people have to their industry and our favorite beverage. Anheuser-Busch and the Germans leave nothing to chance. After the informational tour we were treated to some fine Budweiser brewed in England. Sitting down with that Bud there at the farm in Bavaria, brought many comparisons to mind After having tasted the fine German Helles in situ, one realizes where the bones of this American standard hail from. It was then off to lunch in the town of Wolnzach, the home of the Bavarian Hop museum. The food was wonderful, the beer superior and the company and conversation stimulating. The experience was the highlight of our trip. Thanks to all of the A.B. and Institute professionals we met for their warm hospitality.